International (FCI) to be an effective and highly reliable solution in a wide range of fluids and industrial applications. 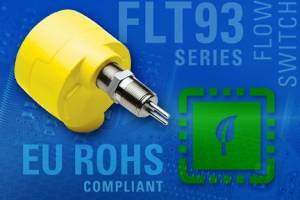 Redesigned with new high-density surface mount technology (SMT) electronics, the environmentally-friendly FLT93 Series FlexSwitch now meets all EU restrictions on lead solder and five other toxic materials found in some electronic devices. RoHS hazardous materials restrictions are related to the EU’s Waste Electrical and Electronic Equipment (WEEE) Directive, which sets recovery and recycling targets for electronic product waste to prevent ground and water pollution and exposure to people. The new design of the FLT FlexSwitch features a state-of-the-art quick disconnect terminal block. The entire electronics assembly is firmly secured into an aluminum or stainless steel housing, which improves vibration immunity in rugged plant environments. SIL2 rated for ultra-reliability, the FLT93 switches are found in the world’s most demanding processes and plants. Ex agency approvals are provided for the entire instrument—FM, FMc, ATEX, IECEx, InMetro and EAC/TR CU. FCI’s FLT93 switch is the process industry’s most advanced heavy-duty thermal dispersion technology flow and level switch in the world. Its multi-parameter measurement design is based on more than 50 years of flow and level switch engineering and application experience, providing a rugged long-life instrument. FLT93 switches are found in continuous operation in the most demanding and critical process and plant applications. They are a preferred solution in oil and gas upstream and downstream applications; wastewater treatment; chemical operations; power plants; food and beverage; refineries; mining; metals; manufacturing and more. The dual-function FLT93 switches can be configured for flow or level sensing, flow + temperature sensing or level + temperature sensing. A single FLT measures and monitors flow or level and temperature simultaneously with excellent accuracy and reliability. Dual trip points and 6A relay outputs are standard and are assignable to flow, level or temperature. FCI’s unique sensor technology built into the FLT93 switches, combined with FlexSwitch temperature compensation circuitry, provides users with unparalleled performance capabilities: Exclusive flow accuracy as precise as ±2% of the setpoint velocity over ±28°C temperature range; repeatability of ±0.5% reading. Level resolution is ±2.5 mm; repeatability of ±1.3 mm. Standard temperature accuracy is ±1°C; repeatability ±0.6˚C; improved temperature accuracy is available with factory calibration. Two standard sensing element configurations are available to meet the most demanding application requirements. The FLT93S switch is designed for use in standard heavy industrial applications and in applications with high velocity liquid setpoint requirements; the FLT93F is designed for fast response gas applications. Both sensing elements can be supplied in either standard -40 to 177°C or medium -73 to 260°C temperature configurations. The FLT93S is also available in a high temperature -73 to 454°C configuration. A wide selection of standard and custom process connections can be provided. The electronic control circuit can be integrally-mounted with the sensing element, or it can be located in a remote location. The standard enclosure is a coated aluminum alloy. It can be used in ATEX locations and is rated for NEMA Type 4X (IP66) environments.